Albion Veterans Club building fund has grown by $6,800 over the past three months. The fund drive total has reached $167,810,which leaves $32,800 to be raised to meet the goal of $200,000. 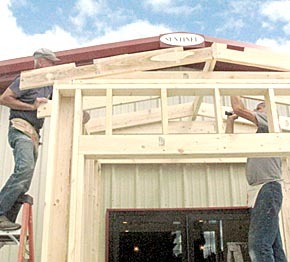 Since its opening last spring, the new Veterans Club has maintained a busy schedule. There are still some fund-raising events in the planning. An auction of the furniture and fixtures from the old Veterans Club building has been scheduled for Sept. 27. Volunteers have framed and sheeted the front entrance enclosure (above), and they are waiting for the exterior metal to arrive. See this week’s Albion News for details.